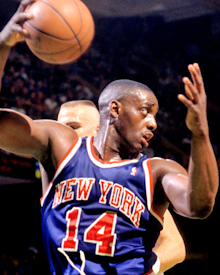 One of the NBA’s most under-rated players passed away on February 28, Anthony Mason. An all-star in 2001, Mason spent 13 years in the league with six different teams. He was 48. A third-round draft choice out of Tennessee State, he is probably best known for his five years as a New York Knick. Following are a few stats you may not know about Mason. 1. Mason is one of 20 NBA players who played more than 2,000 minutes in a season without starting a game in that year. Mason did it twice: 1991-92 and 1992-93. He is one of only four players to accomplish this feat multiple times (the others were Jamal Crawford and Dell Curry, three times each, and J.R. Smith, twice). Mason is one of only two players in NBA history to play over 2,100 minutes in a season without starting a game; Mason did it twice, Crawford three times. 2. In the first six years of his career, Mason started only 23 of the 337 he played (just under seven percent). In the final seven years of his career, Mason played 545 games, starting 536 of them (over 98 percent). 3. 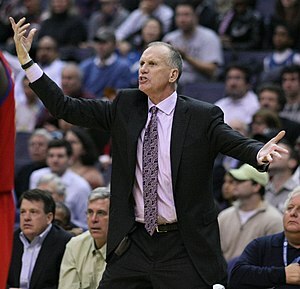 Mason was presented the NBA’s Sixth Man Award after the 1994-95 season. The following year he led the NBA in minutes played with 3,457 as a member of the New York Knicks. He started all 82 games that year for the Knicks. 4. J.R. Smith holds the NBA record for most minutes played in a season without starting a game with 2,678 in 2012-13. Mason is second on that list with 2,482 (he did that in 1992-93). Mason also has the eighth-most minutes in this category with 2,198 in 1991-92. 5. Mason’s career numbers include 9,656 points scored, 7,279 rebounds and 2,963 assists. He is one of 39 NBA players to have 9,000 points, 7,000 rebounds and 2,500 assists in a career. Of those 39, 19 are in the Basketball Hall of Fame. 6. Mason played 882 games in his NBA career. He is one of only 14 NBA players to have 9,000 points, 7,000 rebounds and 2,500 assists in a career with less than 1,000 games played. Of the 14, nine are in the Hall of Fame. The other four not in the Hall: Pau Gasol (he will likely pass the 1,000-game mark in his career), Lamar Odom, Chris Webber and Bill Bridges. The Philadelphia 76ers, Indiana Pacers and Los Angeles Clippers exorcised some serious NBA playoff demons with their first-round series wins in this year’s playoffs. The 76ers had not won a playoff series since 2003 when they defeated the New Orleans Hornets in the first round of the Eastern Conference playoffs. For the Pacers, their last playoff series win was in 2005. The Clippers last won a playoff series in 2006 when they ousted the Denver Nuggets in the first round. Here’s a look at which teams now have the longest droughts for winning a playoff series. Of the eight remaining teams in the playoffs, here’s a look at the last time they advanced to the conference finals, the last year they played in the NBA finals, and the last year they won an NBA title. The first round of the 2012 NBA playoffs tip-off with four games today and four tomorrow. The San Antonio Spurs will be playing in their 15th consecutive NBA playoffs, the longest active streak in the league. Mark Cuban’s Dallas Mavericks hold the second spot in that category; they are playing in their 12th straight playoffs. 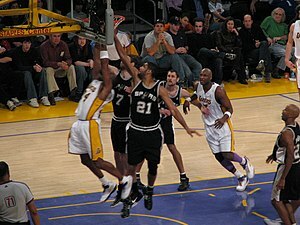 Starting with the 2003 playoffs, the NBA went to a seven-games series in the first round instead of the previous five-game first round series. As you might expect, the Spurs have won the most first round games since 2003 with 31. They are followed by the Los Angeles Lakers with 28 and the Mavs with 26. Since 2003, the Spurs have won seven of the nine first round series they have played. The Lakers have won six of the eight first round series they have played. One of the surprises is that the Detroit Pistons have won six of the seven first round series they have played in since 2003. Here’s a look at how well each team has done in the first round of the NBA playoffs since 2003. Team, First Round Games W/L Record (2003-11), Winning Pct. Did you know? The Boston Celtics and the Lakers are the only teams to have won a first round series in each of the past four seasons. 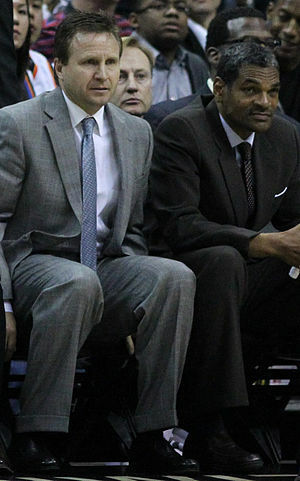 The Atlanta Hawks have won a first round series in each of the last three playoffs.